$12,749.99 each List: $21,096.00, You Save: $8,346.01! The Adams Schnellar Series Timpani is based on the century-old drums used by the eminent Royal Concertgebouw Orchestra of Amsterdam, in collaboration with timpanists Marinus Komst and Nick Woud. The traditions of old meet the scientific advancements of today! The method of changing pitch is the most unique aspect of this 23" timpano. With most timpani the bowl stays put while the hoop moves up and down to change the tension on the head. With these drums, the bowl itself moves up and down, while the hoop and tension rods remain stationary! 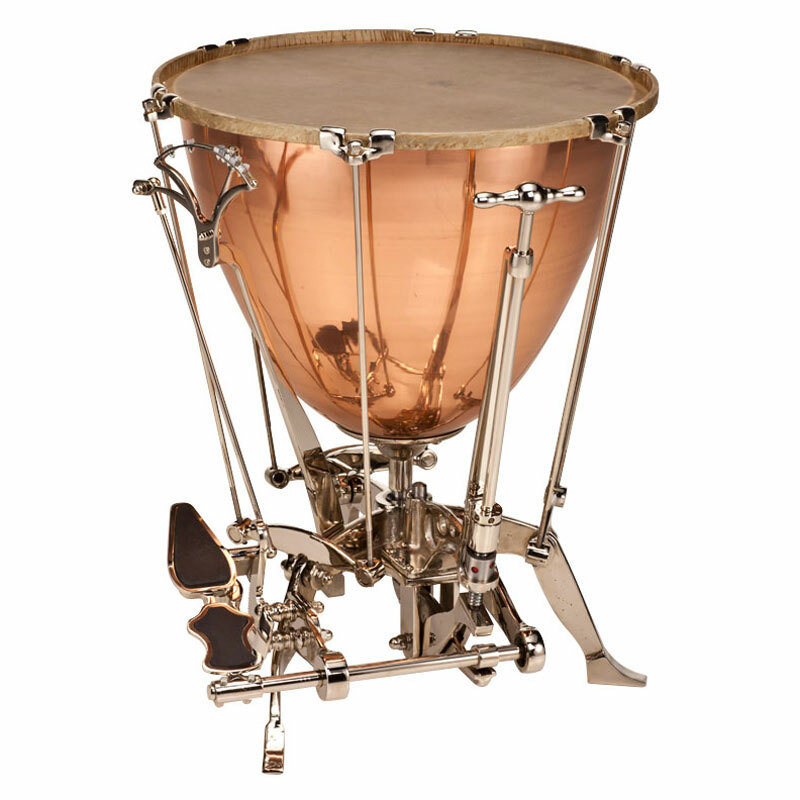 This tuning method gives the Schnellar timpani a uniquely focused tone, emphasized by a three-legged base that creates minimal contact with the floor and a hammered copper bowl with a pointed shape to decrease tension. Some say that these instruments are the best-sounding in the world. Utilizing modern technology, this drum is equipped with a Remo Renaissance head and a counterhoop with tension rods. While some timpanists still prefer traditional calf heads, the minimal maintenance requirements and resistance to change from humidity are often worth the trade-off. The Dresden pedal on this drum allows you to lock pitches in place with a level of stability unachievable by balanced action pedals. A hand-operated fine tuner lets you slightly adjust tuning to make sure you're always at one with the orchestra during a performance. Everything on this drum screams elegance, from the chrome vanadium steel base to the specially-fashioned pedal. Even the tuning gauge has a certain 'heavenly' flair to it. This timpano, like all Schnellar timpani, comes with a specially designed flight case and a wheeled cart to make transportation as effortless and worry-free as possible. A wooden head protector is also included to protect the drums when they're on the stage, as well as a muffle for when you need to play a little more staccato.